Archives : BACK TO THE SUPPORTS - 29/04/2011. BACK TO THE SUPPORTS – 29/04/2011. The Nifty continues to move in a range between 5700 and 5900. After testing the resistance around 5900 at the start of the week, the Nifty fell and went down to test the support around 5700. The weekly closing is on the weaker side and even though the long term (200dma) and medium term (50dma) trend remains intact, the short term trend has turned bearish as the Nifty is below the 20dma. Last week the Nifty was placed just below the Bullish breakout level and this week it is the opposite, i.e. the Nifty is just hanging on to the support levels near the lower end of the trading range. A breach of the support levels will trigger a strong wave of selling. Stock markets normally associate the month of May with bearishness and this time too the start of the May series does not give much comfort to the Bulls. The Sensex opened the week at 19538 made a high of 19697, a low of 19015 and closed the week at 19135. The Sensex lost 467 points on a weekly basis. Similarly Nifty opened the week at 5859, made a high of 5906, a low of 5706 and closed the week at 5749. The Nifty too closed with a loss of 135 points on a weekly basis. On the weekly charts, both the indices have formed a Bearish Black body candle. On the daily charts, Deliberation pattern got completed when a bearish candle was formed. If we take the last three days into account, there is a Bearish Three Black Crows formation on both the indices. This is a Bearish Reversal pattern but many times after this pattern gets completed, there may a small pullback before the downtrend continues. Week after week the market continues to test the 200dma, 100dma and 20dma and this week too was the same. Even though the market has just managed to stay above the 200dma (Sensex – 19144 and Nifty – 5747) and 100dma (Sensex – 19012 and Nifty – 5700) but it has closed well below the 20dma (Sensex – 19440 and Nifty – 5836). Thus the short term trend has turned down. The market is still above the 50dma (Sensex – 18749 and Nifty – 5624) and as a result the medium term trend continues to be positive. Even though the long term trend is just about managing to be positive, but it is being tested week after week and hence caution is advised. The market is continuously testing the 61.8% retracement level of the entire fall of Sensex from 21108-17295 and Nifty from 6338-5177. These levels are 19651 for the Sensex and 5894 for the Nifty. This week too the market tested the above mentioned levels and fell from there. Currently the indices are undergoing a short term correction of the entire rise from 17295 to 19811 for the Sensex and 5177 to 5944 for the Nifty. The correction levels are 18850-18553-18256 for the Sensex and 5651-5560-5469 for the Nifty. The low made two weeks back i.e. Sensex 18976 and Nifty 5693 is close to the 200dma and 100dma. Hence we have a strong support zone between Sensex 19144-18976 and Nifty 5747-5693. If the market manages a weekly close below Sensex 18976 and Nifty 5693, then the Flag pattern will not be completed. The Rising Channel formation is still in place but the indices have breached the Channel Top which was acting as a support, and have now gone below it. Similarly the top made three weeks back (Sensex 19811 and Nifty 5944) has not been surpassed despite being tested several times. This resistance is further strengthened by the supply Trendline falling at Sensex 19751 and Nifty 5887 and 61.8% of the entire fall i.e. Sensex 19651 and Nifty 5895. Thus 19751-19811 for the Sensex and 5887 – 5944 for the Nifty is likely to provide strong resistance going forward. MACD is in Sell mode despite being in positive zone, whereas ROC is in Sell mode as it is in negative territory. RSI has just fallen below the centerline and has given a Sell signal. Money Flow (27) is in Sell mode whereas the OBV has given a fresh Sell signal. Stochastic oscillator has given a Sell signal as %K has cut %D from above. The Directional Indicators too have given fresh Sell signal as +DI has cut –DI from above. The ADX has gone down to 25 suggesting that the uptrend has lost some of its strength. Nifty O.I. PCR has fallen to 1.31. Highest Put buildup is seen at the strikes of 5600 followed by 5700, which suggests presence of strong support between 5700 and 5600. At the same time, highest Call writing is seen at the strike of 6000. Thus the Nifty is likely to face strong resistance around 6000. The Trendline Resistance for the Sensex is at 19607. The Trendline Support is at 18930. 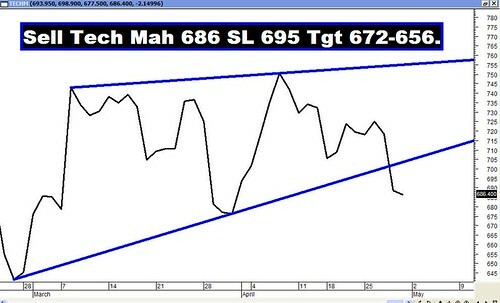 The Trendline Resistance for the Nifty is at 5887. 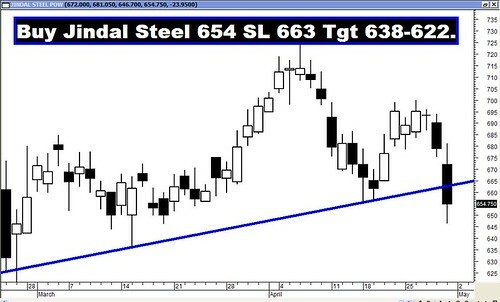 The Trendline Support is at 5646. For the week ahead, Sensex will find Support at 18826-18542-18218 and will find Resistance at 19342-19574-19811. For the week ahead, Nifty will find Support at 5646-5563-5480 and will find Resistance at 5801-5864-5932. Expect Volatility to increase in this week and hence it is advised to hedge ones position.